We now enter into Notebook Two of the six notebooks that make up the Diary of Saint Faustina. The reason for having more than one notebook is simply that when one notebook was filled by Saint Faustina she began with a new one. Therefore, there is nothing particularly different from one notebook to the other. However, for the purpose of this current book of daily reflections, each reflection will begin to be lengthened, starting here with Notebook Two, so as to help you, the reader, enter more deeply into the beautiful mysteries of faith and our shared spiritual life that have been revealed in these writings of Saint Faustina. You are invited once again to take one reflection each day and to ponder it throughout the day. Try to pray the prayer for each reflection each morning, noon and evening. Allow each mystery reflected upon to become a source of wisdom and understanding for you. The “world” is referred to in Scripture many times, especially by Jesus Himself. He said that the world will hate you and will not understand you. The world will, in fact, persecute you. This could become the cause of fear and distress for some. It causes these effects within us when we are overly concerned about looking good in the eyes of the world and acting so as to win its esteem. Do not fall into this trap. The world will love you only if you become worldly, taking on its secular and sinful values. Instead, keep your eyes fixed on Heaven. Live as though you are in the world, but not of it. Allow the Lord to shield you from worldly enticements so that you will live only in Him and for Him at all times (See Diary #537). The Will of God is much more than a future plan God has laid out for you. It’s more than His hopes and dreams for you. His Will is your path to holiness and it is a source of the greatest consolation and joy. His Will is both active and passive (permissive). It’s active in that He has definite plans for you and calls you to discern those plans and embrace them. It’s passive in that He will permit certain evils to befall you as a result of your own sins and those of the whole world. Do not fear when God permits some evil or some suffering to come your way. Jesus Himself is the perfect example of one who experienced the effects of the permissive Will of the Father. Do not be surprised or scandalized by what God permits. His passive and permissive Will invites you to trust in Him in all things and allows you to grow in faith and trust of Him no matter what your future holds. Do not be afraid of that which God permits. (See Diary #541). Reflect upon any way that you are confused or even scandalized by what God has allowed to happen in your life. Know that He knows what He desires and He knows what He permits. Do not be afraid of His permissive Will. Do not be afraid to accept all that befalls you with faith and confidence. What God permits is done so as to manifest His providential care for you and as a way of increasing your own faith and trust in Him. Lord, when I suffer, I sometimes doubt Your love and care for me. I question whether You are there, sustaining me and leading me. Give me the grace I need to endure all the effects of sin in our world. Help me to face the effects of my own sin and those of the world with courage and confidence in Your protective hand. Jesus, I trust in You. God is wholly independent in that He perfectly sustains Himself. The Father, Son and Holy Spirit form a perfect unity through which they are interconnected and interdependent. And this interdependence is all They need. However, the Trinity freely chose to become dependent upon each one of us in a unique way. By choosing to enter into our lives, uniting with us, and forming a bond of love with us, God, in a certain way, makes Himself dependent upon our trust. His dependence upon our trust relates to the depth of love and the bond He forms with us. Without our trust, God has limited Himself in how deeply He can unite Himself with us. Therefore, God offers Himself to us freely and without reserve, but requires our full participation for this perfect gift of love to become complete (See Diary #548). Do you understand your role in the life of the Holy Trinity? The Father, Son and Holy Spirit offer you perfect love, but will not impose that love upon you. They invite you to freely reciprocate this love. Only in this free choice, on your part, to accept Them in trust, can God fulfill His choice of being one with you. Allow God to fulfill His longing of union with you. Do not reject this love nor be hesitant to reciprocate it. My God, Father, Son and Holy Spirit, I thank You for the gift of Your life and Your love. I freely accept this perfect Gift of Yourself. Help me to daily grow in trust of You so that I may receive You and offer myself back to You with the same generosity that You have shown me. Jesus, I trust in You. One of the primary ways we stop the Mercy of God from entering into our lives is through obstinacy. Specifically, when we obstinately hold onto our own opinion, as a result of our pride, and therefore fail to be open to the truth, we shut the door to grace. This is a particularly dangerous sin because obstinacy, by its very definition, implies there is an unwillingness to repent and change. The obstinate person remains, day after day, year after year, closed to the grace of God. The only cure for an obstinate heart is humility before the Truth of God. Coming to God, with a sincerely open heart, ready and willing to change our convictions the moment He speaks, is the first step to being rid of this sin. Humble yourself by listening, setting aside your own firm opinion, being open and willing to change. This may be difficult at first, but you will be truly grateful you did (See Diary #560). What are you obstinate about? Is there a long-standing thought you hold against another? Is there something that you are convinced you are right on? Make sure that God feels the same way. Seek, today, to be open to change. The first step is to ask the Lord to open your eyes to see. The second step is to let yourself see this tendency within your heart. Lord, I know I am obstinate. I see it within my soul. I hold on to my will and refuse to listen to others out of pride. Give me the grace of an open mind that I may shed my stubbornness. Help me to humble myself before You and others and help me to be ready and willing to listen to Your Truth. Jesus, I trust in You. The ultimate purpose of your life is love. And, more specifically, it is first to love God with a pure love. For love to be pure, it must be freed from all selfishness. Pure love looks only at the one being loved. When we love God with a pure love, we will find that we are drawn to God for His sake, because He is glorious and worthy of our love, and because loving Him is right and just. When we can love in this way, selflessly and focused only on God’s greatness and beauty, then we will discover something else quite glorious. We will discover that, as a result of our pure love of God, we are also filled with a joy so abundant and powerful that we need no other reward. The joy that fills us as a result of loving God with a pure love becomes so strong that it overflows into a profound and sincere love for others. This is the greatest satisfaction in life. We truly need nothing else to be happy beyond measure (See Diary #576). Are you happy? If not, what do you blame for your lack of happiness? It’s easy to point and assign blame. However, we must realize that happiness comes only as a result of our choice to love God with a pure heart of love. Reflect upon whether this is something you are experiencing in your life. Ponder the love and affection you have for God. Think about how strong or how weak this love is. And remind yourself that, if you love God purely and above all else, this love will order your life so perfectly that the joy you experience will satisfy you above any other earthly consolation. If you want to be happy, seek to love God with a complete and pure heart. Lord, I know my love for You is far from perfect. Help me, this day, to turn my eyes and heart more fully to You so that my love of You may be purified, allowing me to love You above all things for Your own sake, because You do deserve my total love. In my love of You, I thank You for the joy that this produces. May that joy overflow so abundantly that I find perfect satisfaction and happiness in this love. Jesus, I trust in You. Who, in their right mind, would want to be humiliated? What would you do if you were humiliated? Most people would be tempted to seek ways to avoid humiliation. Some would become deeply hurt as a result. Others would become angry and defensive. And though the source of one’s humiliation may not be fair, it’s important to understand that humiliations can become an invitation to the deepest depths of God’s grace and Mercy. Humiliation has the potential to produce humility when embraced properly. Though anger and hurt may also result, humility must be the goal. What matters most is that we shed any pride, anger or hurt that we experience and allow ourselves to enter into the depths of humility. This necessary quality will enable us to rely solely upon God, seek consolation and peace only from Him, and allow Him and His holy Will to be the one and only source of our joy in life. Nothing could be better for the soul than the humility that comes from humiliations (See Diary #593). What is it that humbles you the most? What wounds your pride and causes you to be angry or defensive? What do you stew over and think about obsessively? If something comes to mind, then this may be something very specific that the Lord wishes to turn into a source of grace and Mercy. Everything, be it sin, injustice, hurt, etc., has the potential to be turned into grace by our Lord. He truly is that All-Powerful. Identify that which wounds your pride the most and try to look at it from a new perspective, letting the Lord turn it into a source of grace. Lord, my pride is wounded so many times. There are so many experiences I have that do not sit well with me. Help me to allow all those things that are out of my control to become transformed by You and Your grace so that they may no longer weigh me down, causing hurt and anger. Take these humiliations, dear Lord, and transform my heart through them so that, in my humility, I may come to know You more intimately and surrender to You more fully. Jesus, I trust in You. Do you know that our Lord chooses certain people for a specific mission of suffering? He picks certain people, who are few in number, to more fully resemble His innocent suffering here on Earth. These holy souls suffer in many and varied ways. They are the continuation of the innocent suffering of Jesus Himself. They have a very specific mission on Earth and it is a mission requiring the greatest sacrifice imaginable. The good news, for these chosen few, is that the crown of glory that awaits them in Heaven makes every act of suffering here on Earth worth it. Through their suffering, completely embraced in joy, and offered to the Father through the Son, they make up that which is “lacking in the sufferings of Christ” as St. Paul explains to us (Colossians 1:24). Though this unique vocation is only given to a few in a profound way, we are all called to share in Christ’s sufferings so as to also share in His glorification (See Diary #604). What do you do with your daily sufferings? Do you “offer it up?” This invitation from Jesus, to unite our sufferings with His, is a true calling that has more potential for grace than anything else. It’s what makes us most like Him. It is the greatest sacrifice we can offer and the most powerful prayer we can pray. Think about the sufferings you encounter in your life. No matter what they are, do not run from them. Try to embrace them and offer them up, joyfully, to our Lord. Heavenly Father, I give to You, this day, all my joys, works and sufferings. I especially offer You the sufferings I endure. I offer You all the small and great ways in which I experience suffering, hardship and pain in my life. May these become a sacrifice of love, offered in union with the one and perfect sacrifice of Jesus, Your Son. Transform this offering and make it a source of grace in this world. Jesus, I trust in You. Do you have fear in your life? It’s important to know that some fear is quite unhealthy, stemming from a form of pride, while another form of fear is quite healthy, resulting from your profound love of God. The “holy fear” is filial fear, which is the fear of a child of God. This particular form of fear is present when your love of God is so deep that you fear doing anything that would harm your relationship with Him. It’s not that you are afraid of God, rather, you have a holy desire to avoid all sin. This form of holy fear must also enter into every relationship of love you have for others. You should deeply desire to avoid all that harms each and every relationship you have been blessed to receive. This is a gift of God’s abundant Mercy (See Diary #610). Consider your love of God. Is it strong enough to produce the healthy desire in your heart to avoid all that might hurt that relationship? This holy fear must become a driving force to develop a profoundly personal relationship with our Lord. Consider, also, your relationship with others. Do you have a healthy desire to eliminate anything that is an obstacle to your wholehearted love of them? Seek this gift of God’s Mercy and the Lord will draw you closer to Himself and to others. Lord, I do love You and I desire to surrender to You everything in my life that keeps me from loving You with my whole heart. Give me a holy fear so that I may draw closer to You and learn to love others as You love them. Jesus, I trust in You. You are called to love God with your whole heart, mind, soul and strength. But how do you do this? What does an active loving of God look like in our lives? Ultimately, we love God through holy obedience. We must obey His Divine Will above all else. Perhaps that seems like a strange concept, that love of God is best expressed in holy obedience. But it is. It’s expressed in holy obedience because of one simple fact: The Will of God is perfect, perfect for us, exactly what we need, it’s what we were made for, and we must enter into perfect submission to His Will. In the end, the only way we will understand this form and depth of love is by living it (See Diary #616). How well do you do with the practice of holy obedience? When you think about this, does it inspire you, or turn you off? Holy obedience can be a difficult virtue to embrace and live wholeheartedly. It can be difficult to accept and to embrace as good. Look at your inner reaction to the idea of striving to obey God in all things. If you can rid yourself of any resistance to this practice, you will find great joy in loving God in this perfect way. Lord, I want to obey You in all things. I thank You that Your law is perfect and, when embraced, completely refreshes my soul. Help me to always love You in this holy way so as to make Your Will my own. In this act, I imitate Your perfect obedience to the Will of the Father. Jesus, I trust in You. Have you encountered the sweetness of Jesus? He, with the Father and the Holy Spirit, come to you in the secret depths of your soul. There, in this hidden place, they desire to communicate with you. Their communication is beyond words and concepts. It’s a communication of profound love that leaves the soul at peace and with a delight of the greatest sweetness. Their encounter with you is not an emotion; it’s a spiritual union (See Diary #622). How deep is your relationship with Jesus, the Father and the Holy Spirit? Is it something more intellectual? Is it based only on the fact that you believe in them, for the most part? Or is it something that goes much deeper? The goal must be to come to know God in a real and tangible way. But that knowledge of Him must also be personal. It must become a relationship that is lived and that sustains you in all things. If the Blessed Trinity lives within you, and if you allow yourself to embrace that relationship wholeheartedly, then you will discover an inner sweetness that overwhelms any suffering or hardship you endure. The sweetness of that love will carry you, day in and day out, to the glories of Heaven. Lord, I long to know You, to love You and to become one with You. I desire to have You live within my soul, refreshing me with the sweetness of Your presence. Take my life, sweet Jesus, and unite me with Your perfect Heart of love. Jesus, I trust in You. “Do not be afraid; just have faith” (Mark 5:36). These four words, “Do not be afraid,” are spoken countless times throughout the Scripture. We should pay attention to them. Fear can paralyze us and lead us into many forms of foolish thinking and acting. The person who acts out of fear truly acts like a fool. That may seem harsh at first, but it’s not if you understand what it means. It simply means that a person acting out of fear cannot act rationally. Fear does great damage to a person’s ability to stay calm, remain focused and think clearly. That’s why the Scriptures speak so directly regarding this important spiritual point. Fear must give way to faith and trust in God (See Diary #626-627). What is it that causes you the most anxiety, worry and fear? It’s a struggle we all deal with. There is no shame in admitting it. So what is it? Identify that which overwhelms you the most and you will identify that which God wants you to surrender in trust the most. Go to the heart of the struggle. Sincerely place that worry and fear into the Hands of God and trust. Trust that God is All-Powerful and capable of handling every situation. He may not change things the way you think they should be changed, but He will lift your burden and enable you to move forward without the fear that can easily paralyze and confuse you. Do not let fear dominate your life. Trust in God and let that trust transform you. Jesus, I do want to trust You and to entrust all my many burdens to You. I especially turn to You with (pause and state that which causes the most fear and anxiety). Please enter into this burden and lift it by Your gentle hand, replacing it with peace and great inner calm. Jesus, I trust in You. There is little doubt that each one of us will encounter, from time to time, the sin of another. It could be in their words, actions or the omission of what they ought to do. Sin hurts and requires correction. Very often, when we are sinned against, we tend to get angry. But the anger we have is not always “holy anger” and is not, therefore, always from God. We can easily allow our wounded pride to be the source of a harsh, or even subtle, correction of another. This, then, becomes our sin. But sin must be confronted and God will, at times, call us to correct others. Our correction may even be severe. But when it comes from the holiness of God, inspiring and guiding us, our correction of the other will not wound them, it will be an act of Mercy. They may need severity, and God may inspire us to be severe, but we must always be careful that what we offer ultimately flows from the Mercy of God (See Diary #633). Reflect upon any moments of contention that you have encountered lately. Were words spoken, or actions done that were based more on unhealthy emotion than on love? Examine how you react when hurt by another. Do you look at them with Mercy and seek to offer the Mercy of God, even if it must come, in that moment, in the form of a holy rebuke? Do not be afraid to let God use you to offer this form of Mercy. It may be hard to distinguish from the sin of anger, but we must strive to offer this Mercy for the good of those we are called to love. Lord, I offer myself to You so that You can use me as an instrument of Your Divine Mercy. When I am sinned against, help me to forgive immediately. But help me, also, to know how best to address the sins of others. Help me to know how to offer correction in love for their good. Give me courage and wisdom, dear Lord, and use me as You will. Jesus, I trust in You. Is it better to do great works, or small sacrifices? It’s easy to conclude that some great work for God is far better than any small sacrifice. But is it? That all depends upon the Will of God. Sometimes we take on some “great work” for God but, in the end, it’s not part of His plan. A work is great only when it is done because God inspired it and remains the one leading it. Conversely, if God inspires a very small sacrifice on your part and you accept it and live it, then you can be assured that this small sacrifice will do more good for the salvation of souls than any other sacrifice you could ever dream up on your own. In fact, trying to force the Will of God to conform to your own will, inevitably, does more damage for the Kingdom of God than good, even if your idea seems holy (See Diary #639). What is it that God is inspiring you to do? How are you called to serve His holy Will? Look for His inspiration in the smallest of things. It may be a kind word spoken to another, or a small hidden sacrifice that only you are aware of. And if He is calling you to do something “great” that others will notice, do not be afraid of this, but do not be overly proud of it either. Do all things, great or small, in accord with the Will of God and you will find that all things you do are truly great! Lord, I believe that greatness is found only in Your holy Will. Help me to set aside my own ideas and agendas so that I may seek only that which is in Your perfect Heart. Help me to humbly embrace every small sacrifice You ask of me, and to have courage to do those things which seem to be beyond my ability. May I listen to You and respond generously to whatever You say. Jesus, I trust in You. We cannot do anything good on our own. This is a fact. All we can do on our own is sin. In fact, the only way to please God and to do good things for Him is to rely upon Him for everything. We must have a relationship of complete dependence upon God in all things. It’s easy to think that we will please God if we simply try harder with an action we have undertaken on our own and believe is good. If we do this or that and do it well, we will please Him. But this is not true. God is not looking for us to do something of our own choosing for Him, and to try and try again until we accomplish it. No, He is only looking for one thing: obedience to His Will in all things. And the only way we can be obedient to that which He calls us to embrace, is by becoming completely dependent upon Him in every way (See Diary #659). Reflect upon the joyful discovery of the Will of God. When we discover what He asks of us, and then accept His Will, we will also, necessarily, enter into a relationship of trust and utter dependence upon Him. This act of depending upon Him to fulfill His Will produces an abundance of peace and joy. Reflect upon whether you see this total dependence upon God alive in your life. Where you see it lacking, surrender more deeply in trust, giving up that which you cling to by your own will, choosing instead the Will of God as He makes it known to You. Lord, I choose this day to become completely dependent upon You and Your most holy Will. I choose, further, to give up my own will and all that I try to do on my own. May my surrender and dependence upon You become the source of my enduring peace and joy. Jesus, I trust in You. A honey bee works diligently, day after day, and a colony of bees all work toward the same natural end. They work to produce honey. This is no small task and requires constant work on the part of thousands of bees to produce a small amount of honey. But, in the end, their efforts pay off and honey is made and stored in the hive. So it is with our lives. We are all called to serve the Lord individually, but we also do so in communion with others. Religious congregations, dioceses, parish churches, families and friends are all called in various ways to serve the Lord as a community of faith. When each one does his or her part, the Lord accomplishes an abundance of good fruit so as to bring the sweetness of His love into a world in much need (See Diary #664). Do you see yourself as a “lone Christian?” Or do you see yourself as a member of the family of God, seeking to do your humble part so that the Church, as a whole, can complete Her mission. The Church is called to bring the sweet love of our Lord into a world starving for love. Reflect upon whether you are doing your small part. Your part is all that you are responsible for. It is nothing other than embracing the Will of God each and every day and each and every moment of the day. Small acts of love, the daily choice to trust, the humble submission of your will. You can fulfill your mission in life and when you do, the Lord will add this to the works of all His sons and daughters and, through His whole Church, He will transform the world, bringing forth His glorious Kingdom. Lord, as a single bee produces only a tiny bit of honey, so also do my actions and service to You produce only that which You have given me to accomplish. I offer my love and service to You so that You may unite it with the love and service of others, producing, together, an abundance of Mercy for a world in such need. Jesus, I trust in You. Do you converse with Jesus? This is a form of prayer that is most fruitful. “Conversation” with God is not the highest form of prayer, but it is a form of prayer that we often need to begin with. Conversation with God is especially fruitful when we carry some form of burden or confusion in life. When this is the case, it can be helpful to speak about this openly and honestly with our Lord. Speaking with Him, interiorly, will help bring clarity to whatever obstacle we are facing. And when the conversation is complete, and when we have heard His clear response, we are then invited to enter deeper into prayer by submitting ourselves to that which He says. Through this initial exchange, followed by a complete submission of mind and will, true adoration of God is brought about. So if something is on your mind, do not hesitate to speak openly and honestly with our Lord about it. You will find that it is an easy and fruitful conversation to have (See Diary # 670). Think about that which bothers you the most. What is it that seems to weigh you down. Try getting on your knees and pouring your heart out to Jesus. Speak to Him, but then be silent and wait on Him. In the proper way and at the proper time He will answer you, when you’re open. And when you do hear Him speak, listen and obey. This will allow you to walk down the road of true adoration and worship. Dear Lord, I love You and adore You with all my heart. Help me to confidently bring my concerns to You, laying them down before You and listening to Your response. Dear Jesus, as You converse with me, help me to heed Your voice and to respond with true generosity. Jesus, I trust in You. If you were to examine the content of your prayer life over the past month, what would you see? Hopefully there would be many moments to surrender, intercession, praise and adoration. And hopefully there were also many moments in which your prayer consisted of deep thanksgiving to God. Being grateful, truly grateful, and expressing that gratitude in prayer is powerful. We have so much to be grateful for and yet, so often, we become more focused in on our problems than on the countless blessings God has bestowed upon us. Even in the midst of life’s darkest hour, there is much that a holy soul can find to be grateful for. Offering prayers of gratitude to God, with much sincerity, has the potential to lift our spirits to the heights of authentic spiritual joy (See Diary #675). What are you grateful for? Better put, in what ways has God blessed you in abundance? If you are not immediately aware of your blessings from God, that is a good sign that you may need to spend more time “counting your blessings.” It’s good to keep our eyes on the innumerable blessings God has bestowed upon us, to see them, name them and be joyful in them. The more we see them, the more we grow in gratitude, and the more we grow in gratitude, the more we are blessed. Lord, I thank You with profound gratitude for the countless blessings in my life. Help me to daily become more aware of those blessings and to be grateful for them. Help me to see that life itself is a gift and that You are active in my life day and night. Help me to especially see these blessings when life is hard, or when some burden weighs me down. May I be filled with a grateful heart and always rejoice in Your goodness. Jesus, I trust in You. When you pray, do you ever sit and gaze upon the crucifix? From an outside perspective, the crucifix is a puzzling reality. Why would we lift high and honor such a horrific event? The brutal murder of the Son of God may not be, at first, something we are attracted to. 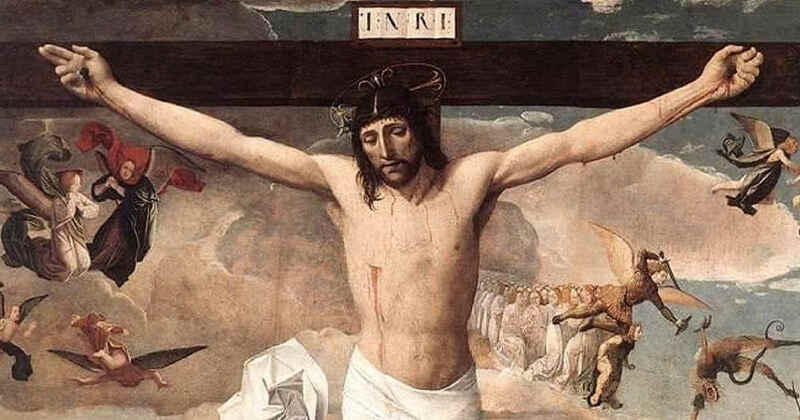 Yet, the crucifix has a power and a draw for those who gaze upon it in faith because it is not only a horrific and brutal murder, it is, first and foremost, the complete victory over sin and death. The Crucifixion of our Lord was the greatest act of love ever known, because in that act, He destroyed death and sin forever for those who turn to Him with complete abandon. The crucifix is also a sign to us of the self-giving we are called to live. We are each called to enter upon that cross and die with Christ, giving ourselves to others. For in dying with Him, our sins are atoned for and we are able to share in the victory of His Resurrection. Gazing upon the Crucifixion of our Lord transforms us as it opens the doors of the Mercy won by this selfless act of love (See Diary #681). Try praying before the crucifix. Try sitting in silence and gazing upon it. To “gaze” is more than to simply “look.” When we gaze we seek to look beyond the image we see and to peer into the love that brought Jesus to that moment. We see a God of infinite love who was willing to go all the way to save us from our sins and love us with a perfect love. Lord, I do desire to gaze upon Your perfect act of love and to see Your Heart, bursting forth with Mercy upon me and upon the whole world. Help me to understand the unfathomable gift of Your Sacrifice and to enter into an eternal gratitude for this gift. Jesus, I trust in You. Perhaps it’s no surprise to hear it said that the Mercy of God is infinite. But “infinity” is quite a concept to grasp. In fact, some would argue that it is impossible to grasp. Delving into something that is infinite and has no bounds is beyond what we could ever fathom. So it is with the Mercy of God. Being infinite, we should realize that we will spend eternity, an infinite existence, seeking and receiving this Mercy that will never end. Right now, on Earth, our experience of the infinite Mercy of God is quite limited. It’s as if we can take in a thimble full while the endless oceans await (See Diary #687 & 692). Do you ever spend time reflecting upon infinity? Think of outer space, which never ends. And how could it? What would be at the other end of the end of space? So it is with God’s Mercy. How could it ever end? How could it ever be exhausted? His Mercy is as vast and wide as God is Himself. Reflect upon the essence of God, and as you marvel at His infinite nature, allow yourself to be drawn into His unending gift of Love. For when you can begin to grasp it, you will desire it. And when you desire it, you will have begun your journey into infinity. Lord, Your love for me is beyond what I can ever imagine. Help me to at least understand that I will never understand, fully, the depth of Your love. Help me to see that Your Mercy is endless and help me to begin my journey into eternity with You. Jesus, I trust in You. Sometimes we tend to push the Will of God faster than God has chosen to move. As a result, we end up doing our own will and not that of God’s. The key is patience. We must patiently wait upon the Lord for Him to act in us so that He is the one doing all things through us. In fact, the act of patience is something that God desires greatly in our lives. Through patience, we are able to let go of our own will and our own ideas and watch the Lord accomplish so much more than we could ever do on our own. We must be diligent, and respond to the Lord when He opens a door or points the way, but we must wait for Him to do the opening and pointing (See Diary #693). What are you impatient with in life? What is it that you want God to move faster at? Reflect upon this inner struggle and know that the virtue of patience opens the door to the guidance and grace that God wants to give. Let Him do things in His time and His way and you will discover that His ways are far above yours. Lord, I know that Your ways are infinitely above mine and that Your thoughts must be chosen over my own (see Is. 55:8). Give me the grace of patience in all things. Help me to wait on You and to trust that Your Mercy will be bestowed in abundance in accord with Your perfect wisdom. Jesus, I trust in You. In your relations with others, do you sometimes feel misunderstood? It could be by a close family member, a friend, a coworker, etc. The problem is that the content of your mind, heart, will, intention, and all of your past experiences are what go into directing your actions. And no one understands all of this except God. We do not even fully understand what we do and why we do it most of the time. As a result, it is easy for others to fail to understand us and what takes place within us. It can also be easy for others to misunderstand us and even judge us. This can be hard to take but we must not let it bother us. Instead, we must direct our concern only to that which our Lord thinks. His Mind and His judgment are all that matters. And the misunderstanding we may experience at times from others must be seen as an act of the permissive Will of our Lord, primarily to test and strengthen our Mercy for others (See Diary #700). Can you think of a time in which you recently experienced the misunderstanding of another? If so, rather than letting yourself become angry or hurt over this, allow it to test the depths of your own merciful heart. Accept this humiliation with grace and give thanks to God that He has permitted you to share in the same act of misunderstanding and judgment that He took upon Himself. In this, you are blessed to be invited to share in the distribution of His Divine Mercy. Lord, give me a merciful heart. When I am misunderstood, help me to accept this as an opportunity for grace, forgiveness and Mercy. Thank You for loving me enough to allow me to endure such a test. I give myself to You, dear Lord, so that You can work in and through me to be a witness of all that You endured. Jesus, I trust in You. Jesus deeply desires to pour forth His Divine Mercy into your soul. He desires to transform your sin and make you His perfect dwelling place. This is a gift beyond what we can grasp, but one we are invited to accept. Accepting the countless graces from our Lord is not only for our good, it’s also for the good of others. Jesus wants you to become holy in every way out of love for you, as His precious child. But He also wants you to become holy for the good of others. The holier you become, the more abundant is the Mercy of God in your life. And the more abundant the Mercy of God in your life, the more others will be blessed by God’s Mercy through you (See Diary #723). Do you seek holiness? If so, it’s easy to think of this goal in a selfish way. It’s easy to seek holiness and Mercy for our own good. But if the gift we experience is truly the Mercy of God in our souls, then we will be compelled to let Him distribute this overflowing Mercy to others through us. Mercy cannot be kept in a selfish way for selfish purposes. It must be received so that we become an instrument to others. Reflect upon yourself being this instrument today, and offer yourself to God for this holy purpose. Dear Lord, I thank You for the abundance of Your Mercy in my life. I thank You for loving me as Your precious child. Help me to be transformed by Your love and, in turn, to become an instrument of Your overflowing grace to others. Jesus, I trust in You. Falling in love can leave one “spellbound.” This form of human love may leave you speechless to a certain extent, not finding it necessary, or even possible, to accurately express what you feel. But the love of God is beyond any experience of human love and, thus, when experienced on a profound level, you will find yourself sitting back in awe and admiration of the God whom you love. No words will be able to capture or express your admiration and amazement of the glory and splendor of the God with whom you have been drawn to love. Your silence and awe will say far more than you could articulate in any other way (See Diary #729). Have you fallen in love? More specifically, have you fallen in love with your God? “Falling in love,” as it relates to God, is not only a human passion or emotion, it’s a spiritual yearning that consumes your soul and leaves you content in His presence. The experience of this spiritual union with God is all that you need in life to find fulfillment and it will be the source of all that you do in life, in that your actions will be solely directed toward the love of God, your beloved. Reflect upon the depth of your love of God and if you do not see this love alive in your life, tell the Lord that you desire it and seek Him with all your might. Lord, I love You and desire to be loved by You. I know my love is far from perfect. Lord, help me to seek You more intimately and to encounter You in the most intimate of ways. May my spirit be filled with a longing for You, and as I meet You may I gaze upon Your glory and splendor. May I truly become “lost” in my deep admiration of You, my God. Jesus, I trust in You. All of us are aware of the sacred Passion of our Lord. But few are able to gaze upon His Passion with true feeling and love. In our prayer, we must learn to meditate upon the Passion of our Lord with great devotion. This is not so much something we do by our own effort; rather, it’s something that we allow our Lord to do in us. We must allow Him to reveal to us the great suffering He went through and, in that revelation, we must allow our whole being to become consumed with love of Him who died this horrid death out of love for us (See Diary #737). Do you spend time meditating on the Passion of our Lord? Perhaps it’s easier to look at the Resurrection and His triumphal victory over sin and death. But the way to the Resurrection and Glorification is through the Passion. Reflect, today, upon how willing you are to allow yourself to be drawn into every pain and every suffering that our Lord endured. Seeing His Passion for what it is allows you to love Him more deeply. The more you become aware of His suffering, the more you will desire to console His wounded Heart through your love and submission to His holy Will. Let every aspect of the Passion of Christ speak to you and change you. The result will be a deeper love of God and an abundance of Mercy for those suffering all around you. Lord, help me to become aware of Your holy Passion. Help me to see the love that enabled You to endure such torment. May I see in Your Passion Your endless love for all and may I, in turn, love those who suffer with the same love I have for You. Jesus, I trust in You. Do you want to become an instrument of the unfathomable Mercy of God? If so, you do this by your deeds, your words and your prayers. First, you must constantly be on the “lookout” for opportunities to show Mercy by your deeds. Too often, when given the opportunity (such as to forgive another), we turn the other way. But we must be vigilant and committed to seeking these opportunities out and rejoicing when they are given. Second, your words can bring forth grace and Mercy, or they can wound and harm. We do harm by harshness or even by our failure to speak when we ought. We bring forth Mercy when we speak words of truth in love, even challenging words, so as to make present the Truth of God. And third, we often forget about the power of praying and offering sacrifices for others. Interceding for the world as a whole, and for individuals in particular, is a way of turning the key and opening the doors of God’s grace. Do not neglect this essential act of Mercy (See Diary #742). Reflect upon your deeds, words and prayers. Can you point to concrete ways by which our Lord has used you to bring His Mercy to others. Try to identify a few of them and if you struggle with this examen, it is a good sign that the Lord wants to increase His daily outpouring of Mercy through you. Lord, I consecrate to You my words, my actions and my life of prayer. Use me as You desire and help me to be attentive to Your daily inspiration. Help me to sincerely seek out opportunities, each and every day, all day long, by which I can spread Your perfect love in this world. I give myself to You, dear Lord. Jesus, I trust in You. When a loved one dies, it is easy to instantly presume they are in Heaven and are no longer in need of our prayers. But one of the greatest gifts we can offer to those who have gone before us is our prayers. It’s true that every person who dies in a state of grace (meaning they do not have unrepented mortal sin), will enter into the glories of Heaven, eventually. However, what we may often forget is that in order to enter into the full glory of the presence of the Most Holy Trinity, every last sin, no matter how small, must be purged away. This is Purgatory, and Purgatory is a clear and definitive teaching of our faith. But Purgatory, itself, is so easily misunderstood. It’s not a place we go to be punished as a result of God’s anger. Rather, it’s a state in which we enter our final purification on account of God’s love. It is His burning love that has the effect of purifying us of every last attachment we have to sin. Every bad habit, every omission of charity, every foul thought, everything that cannot enter into Heaven with us. Purgatory is an act of God’s Mercy and we are called to help pour forth that Mercy on others through our prayers, sacrifices, and indulgences offered on their behalf after they pass from this Earth (See Diary #748). Think about your loved ones who have gone before you. Let your love for them compel you to pray for them, especially today. Trust that the prayers, sacrifices and indulgences you offer for them are the greatest gift of Mercy you can give. Lord, I pray for (mention a loved one who has passed) and pray for Your Divine Mercy to flood his/her soul. Purify every sin away and grant entrance into the glories of Your Heavenly Kingdom. I pray also for all holy souls in most need of Your Mercy. Jesus, I trust in You. Human suffering is one of the greatest mysteries of life. The Diary of Saint Faustina, as well as the whole spiritual tradition of our faith, reveals much about this profound mystery of suffering. First, from a purely secular point of view, suffering is far from desirable. In fact, it is typically avoided at all costs and seen as the greatest of tragedies. However, from a Christian perspective, suffering itself has been transformed by Christ and made the greatest instrument of grace ever known. It was through His intense suffering on the Cross that the salvation of the world came about. And by freely embracing all suffering, He made it the means and source of all grace. By so doing, Jesus also invites us to see our sufferings as an opportunity for grace. By embracing it, uniting it to His Cross, and offering it to the Father, our suffering is also able to take on infinite value and become a channel of the Mercy of God. Suffering, freely embraced by a Christian, must become a sign of one’s closeness to Christ and a path to holiness (See Diary #774). Suffering can be very difficult and yet unavoidable most often in life. Rather than run from it, reflect, today, upon the fact that God is able to use your suffering for good. This is a mysterious calling and requires the greatest of faith and trust. But when entered into, you will discover that the power of God overshadows and transforms even that which is most painful in life. Lord, help me to entrust to You all suffering. Help me to have hope in You and to fix my gaze upon Your Cross during the most troubled times of life. Use me Lord, and use my suffering as a source of my holiness and for the upbuilding of Your Church in holiness. Jesus, I trust in You. Imagine the scene of our Blessed Mother in the humble state of the Nativity. She had no home at that moment other than this place where animals gathered. Yet in the stillness of that holy night, she was at home as she gazed upon her Child with the deepest adoration and love. She gazed in silence as He lay sleeping on the hay. This must be an image of your soul. You are called to enter into the humility of the inner dwelling place of your heart. Deep within, you must see this Precious Child, resting in peace. Remain silent and attentive, keep your eyes fixed on Him in adoration, and allow yourself to become consumed with delight at His presence within your soul (See Diary #785). Reflect upon your humble and silent prayer. As you sit quietly before Jesus, or even as you go about the duties of your day, are you attentive to the divine presence of your Savior living within you? Do you see Him sleeping there in the stillness? Our souls must become a place of prayer and silence so that we can humbly keep our eyes upon our Lord within this holy dwelling place. If you keep your eyes upon Him, as He dwells silently within you, you will then go about your day with the peace and joy that only this holy Child can bring. Lord, bring humility and stillness to my heart. May I discover You resting there in peace and adore You with a profound love. May I always keep my eyes upon You and never become distracted by the many temptations of this world. May the adoration I offer You who dwell within me become a source of the love and service I offer to all. Jesus, I trust in You. One painful experience you may face is that of the rash judgment by another. At times, others will look at you with judgment and disdain for reasons out of your control. Perhaps they will identify some small fault and magnify it in such a way that they use it as the lens through which they see your whole life. This can be quite painful and can evoke much disordered emotion. But it doesn’t have to. The only thing you can do in the face of rash judgment is to forgive and seek to offer Mercy. But how do you do this? It is only possible if you are first hidden within the Mercy of the Lord. If you allow your eyes and heart to gaze continually upon His Mercy, and if you allow Him to cover you with that Mercy, then one effect will be that the harshness of others will not enter into your soul. Instead, when pierced with this lance, your heart will pour forth the Mercy that our Lord has poured upon you in abundance (see Diary #791). Reflect, today, upon two things: 1) Are your eyes fixed, intently, upon the Mercy of God? Does His Mercy cover you, shield you and hide you from the cruelty of the world? 2) If so, when you are an object of scorn or ridicule, do you allow the Lord to open your heart so as to pour forth His Divine Mercy? He wants to use your heart to be an instrument of His own sacred and pierced Heart. You allow Him to use you only when you first allow Him to consume you with His Mercy. Lord, consume me with Your Mercy. May I find in You my dwelling place and may my heart become fully united with Yours. As my heart becomes one with Yours, dear Lord, use it as a source of Mercy for others. When pierced, allow it to pour forth Your grace in abundance. I give my heart to You for Your perfect purpose and Will. Jesus, I trust in You. Do you ever struggle with making the right moral decision? This happens as a result of our fallen human nature. We are easily confused in life and can easily fail to grasp the Mind and Will of God. So what should you do? Know that your conscience is a sanctuary to which the Lord must be invited. When invited, He will come and dwell there to teach you all things. When facing decisions in life, pray, seek counsel from others, and seek the many truths revealed through Scripture and our Church. These are all sources of the Mercy of God. Afterwards, if you have truly sought the Lord and His holy Will, act as your conscience commands. Listen to it, trust it, and act on it. If in the future you see that you have erred, do not hesitate to change. But do not hesitate to move forward in the way that you hear our Lord directing you. He is a God of abundant Mercy and the pure and holy intention you have gives much joy to His Heart (See Diary #800). Do you struggle with making decisions in life? Do you worry that you are offending our Lord? If so, let go of these worries for they may be the result of a scrupulous conscience. Instead, do your due diligence by seeking the reasonable advice of others whom you trust, seek guidance from the Scriptures and from our Church, pray and abandon yourself to God and His holy Will, and then trust your conscience and act. Think about that decision that you may struggle with right now. Work through this process and leave the rest to our merciful Lord. Lord, help me to seek Your holy Will in all things, to come to know Your holy Will and to act on it with full confidence. Give me, also, the grace of humility to change when I see that I have erred. Bless me, dear Lord, with a clean conscience so that I may glorify You always in freedom and love. Jesus, I trust in You. The content of your daily speech is a clear reflection of the content of your soul. So what does your speech reflect? Very often you may find that your conversations throughout the day have been about superficial and worldly matters. Though some casual conversations of this sort are normal and healthy, you should also be able to point to regular conversations that speak of the glory of God and your life of faith. You should be able to see daily words of charity and holiness. And you should see words that build others up (See Diary #804). Reflect upon your conversations of the past week. What have they been about? Have you fallen into the trap of being cunning or harsh? Have you criticized or put others down? If so, these conversations reveal your soul. At times, your conversations may not fall into the category of sin, but may be dominated by worldly and unimportant things such as a fascination with wealth, or entertainment, or jokes or the like. Though none of these may be evil in and of themselves, if they are the dominant content of your speech then there is little room for the Lord. Seek to make your words and daily conversations a reflection of your deep love of Christ. Let your speech become an outpouring of the Mercy of God alive in your life. This is one key way through which God reveals the sanctity of your soul and uses you to bring holiness to others. Lord, I surrender to You my speech. I give to You every thought I have and every word that comes forth from my mouth. Please use my words to reveal Your glory and the Mercy that permeates Your Heart. May this Mercy also permeate my heart and flow forth from my lips as an invitation to holiness for all. Jesus, I trust in You. Have you discovered the great joy of going to Confession? Some do not consider the Sacrament of Confession to be a great joy. Instead, they see it as a painful and humiliating experience. But perhaps some need the humiliation of an honest confession to help break them out of their sin. Others, those who sincerely seek the abundant Mercy of God, will take great delight in going to Confession because they see the glorious effect it has upon their soul. Seek to love Confession. Pray that it becomes something that you long for as you anticipate the wonderful fruits of this holy purification (See Diary #817). When is the last time you went to Confession? If it has been a while then this reflection is for you. The Lord is calling you to receive the Mercy He has infused into this glorious Sacrament. By going to Confession and receiving absolution you are encountering Jesus Himself. It is He, hidden within the priest, who absolves you and cleanses your soul. Do you believe this? Do you want this grace for your soul? Reflect upon that which deters you from Confession. It may be inconvenience, or a busy schedule, or fear, or distrust of a particular priest. Whatever it is, keeping you from this Sacrament, allow the Lord to remove it. The Lord loves you and is calling you to His Merciful Heart. Rejoice in that fact and foster within your soul a holy longing to receive all that He wishes to bestow through this sacred gift of Mercy. Precious Jesus, I entrust myself to Your Mercy and pray that I will be open to this gift as You desire to bestow it. I pray that I may have a burning desire for the Mercy You wish to offer me through this Sacrament. Humble me Lord, and help me to confidently open the wounds of my soul to Your healing grace. Jesus, I trust in You. When pondering the love and the Mercy of God, it is tempting to see His love in a more general way, as if it were something evenly distributed to all people in the same way. But God’s love for you is something so much more than a general gift to all people. It is deeply personal and singular, being offered specifically for you, out of love for you. God does not see you as one of many; rather, He sees you as a singular focus of His love. Each and every person is loved by God in this singular and unique way. Thus, you are loved as His one precious child for whom He has offered His life. Know that God loves you as you. He knows every detail of your life and pours His grace upon you (See Diary #824). How aware are you of the unique and singular love God has for you? His love is personal in that you are an object of His burning Heart of Mercy. God is fully capable of loving each and every person in this way, seeing each one as His precious child and loving each person in their uniqueness and even in their sins. Let yourself, today, experience this personal and abundant love of God in your life. It will sustain you in all things and help you to always know that you are loved above all. Lord, I love You and adore You and thank You for loving me with a perfect love. Help me to receive Your unique gift of love offered to me as Your precious child. May I return this love for You by acknowledging You as my one and only Lord and God. Jesus, I trust in You. Light dispels the darkness. Scientifically speaking, we know that light and dark are not opposing forces; rather, dark is the absence of light. And when light enters in, the darkness is no more. So it is with the Mercy of God. Without Mercy, our souls are dark. We fall into doubt, confusion, fear and despair when Mercy is absent. In this case, we are left in utter darkness where the filth of sin can reign. But God desires to bring the light of His Mercy. When this happens, and when we open our souls to this gift, the darkness of doubt, confusion, fear and despair vanish. They cannot remain where the Light of Mercy resides (See Diary #831). When you look at your soul, what do you see? Is there darkness? Do you see its foul effects? Do you see doubt, confusion, fear or despair? Do you see sin? If so, the Lord desires to dispel the darkness that breeds these burdens and bring forth His merciful Light. Reflect upon the part of your soul that appears to be in most need of His Mercy. Know that He wants to enter that area of your life and waits on you for the permission to do so. He will wait for you to let Him in. Lord, please come into the darkness of my soul. Bring forth the bright rays of Your Light and dispel all that is not of You. Come refresh me and renew me, Lord. Help me to see and to know Your great love. I desire to live in the Light of Your Mercy, dear Lord. Jesus, I trust in You. Do you see the wretchedness of your own soul? Some may be offended by such a question. But if we understood the Mercy of God, and realized that it is our “wretchedness” that enables Him to be glorified the most, we would not shy away from such a thought. Many want to be holy and to see themselves as holy. It’s easy to think, “If I am good, God will be pleased.” But what we fail to realize is that God is glorified most when we see our littleness, our nothingness, and our wretchedness before Him. It is then that He can manifest His glory to the greatest extent through us. True, we have infinite dignity and value as persons as a result of being made in God’s image and as a result of God taking on our human nature. But in our actions, we are sinners incapable of doing anything good. When we realize this, we open the door for God to enter in and manifest His Mercy. We let Him act through our weakness and do glorious things. This is the way we give glory to God (See Diary #836). When you consider your holiness, do you tend to think highly of yourself, as if you have done many good things for God? This is pride. Humility is the virtue that allows you to see your weakness and complete dependence upon the Mercy of God. It enables you to realize that without Him, you can do nothing. It enables you to cry out with St. Paul, “Wretched man that I am” (Romans 7:24). But in that cry, you also perceive the unlimited Mercy of God using you in your weakness and, thus, become an image of His glory. Lord, help me to see clearly my weakness. Help me to humble myself before Your greatness and, in that act, to be open to Your transforming power in my life. I give my littleness to You, dear Lord. Manifest Your glory through me as You desire. Jesus, I trust in You. When you see someone with manifest sin, what is your reaction? Many people react with disdain and harsh judgment. When someone breaks the law, we harshly condemn them. When someone lives an immoral lifestyle, we belittle them. Very often, our attitude toward the sinner is merciless. This is a problem. True, we must see sin for what it is and work to oppose it, especially when it affects others. But we must always hold in our hearts a deep love for sinners. We must have a longing for their repentance and always see the innate dignity they have as persons (See Diary #842). What is your reaction toward the sinner? Be honest and look first at how you react interiorly. We are all sinners. Some sins are more manifest than others and some live sinful lives in an open and obstinate way. But should we allow ourselves to condemn them? We must judge an objective action for what it is, but the person must never be judged. This is solely up to God. Reflect upon your attitude toward those with more manifest sins. Pray that instead of becoming harsh and critical you will long for their conversion and love them wholeheartedly despite their actions. Lord, give me a heart of mercy for sinners. Help me to love them with a burning love and to suspend my temptations to judge. May I long for all people with Your Heart of Mercy, desiring their holiness. May I also be aware of my own sinfulness and daily seek Your merciful Heart. Jesus, I trust in You. When we become aware of our sins we may have various reactions. We may remain indifferent, or repent out of fear of God’s justice. But the ideal response is to turn to God with love and to have true sorrow as a result of that love. If we have a burning love for God, we will become attentive to even the smallest sin we carry. And every sin we see, we will desire to be rid of. This burning love brings us to an act of perfect contrition by which our love of God purifies the smallest speck of sin on our souls (See Diary #852). Do you see your sin? If so, how do you react to it? The way you react to your sin is a good measure of your love of God and Your trust in His Divine Mercy. If you react with indifference, your love is lacking. If you react in guilt and fear of punishment, your love is lacking. But if you react with trust in God and a total abandonment to His Divine Mercy, then the love you have in your life will become the source of even more Mercy poured upon you. Think honestly about your reaction to your sin and pray that the Lord will bless you with such an abundance of love for Him that you will be overjoyed at seeing that of which you need to repent. Lord, give me such a perfect love for You that I become aware of every sin in my soul that displeases You. As I see my sins, even the smallest of sins, give me the grace to run to You in trust so that Your Mercy will purify me and make me holy. I love You my dear Lord. Help me to love You more. Jesus, I trust in You. Imagine being All-Powerful, or being an intimate friend of one who is All-Powerful. There is a story of Pope St. Leo I, who lived in the fifth century, which reveals the power of God. It is said that Attila the Hun and his violent army sought to sack Rome. Pope St. Leo met Attila and “persuaded” him to turn back. Later, when Attila’s army asked why he turned back, Attila stated that he had been alarmed by a figure dressed as a priest who stood at the pope’s side. This figure was holding a drawn sword and acted as if he would strike Attila dead if he advanced. In fear, Attila turned around and left. This short story reveals the power of God to defend us against all wickedness. Though an angel may not appear in physical form next to you, you can be assured that if you are immersed in the Mercy of God, there is nothing you need to fear. All the powers of Heaven will be on your side. The Lord will defend you against every evil and will give you strength to accomplish all that gives Him glory (See Diary #858). Reflect, today, upon two things: 1) Your unity with Christ; 2) The power that flows from that unity. Do you trust that the Lord will protect you from all evil? Do you realize that fear is useless when you have faith and are clothed with the Mercy of God? Reflect upon this fact and surrender yourself more fully to the Lord who must become your Sole Commander in life. My Lord and my Sole Commander, I trust You with my life. I entrust to You my whole being, especially all things that tempt me to fear. Give me confidence in Your Divine Mercy and help me to rely upon You in all things without reserve. Jesus, I trust in You. When you pray, and when you pray long and hard, the Lord will enter in. He will commune with you and unite His Heart to yours. You will experience these effects in various ways. One common effect is that the closer you are drawn into union with Christ, the more you will desire this union. And the more you desire this union, the more you will be drawn into union. Your prayer has a cyclical effect upon your union and your desire. This is good to be aware of so as to allow our Lord to use your desires to be drawn into greater holiness of life (See Diary #867). What do you desire the most in life? What is the treasure you seek? This is an important reflection to make in an honest and sincere way. “For where your treasure is, there also will your heart be” (Mt. 6:21). If the Lord is your greatest treasure in life, then your heart will be drawn to Him in a powerful way. You will desire intimacy with Him and that desire will draw you close. Reflect, honestly, upon what you desire and allow the insight you gain to reorder the priorities you have. Lord, please help me to make You the central Treasure of my life and to seek You and to desire You with all my heart. As I am drawn to You, increase my desire, and as You increase my desire, draw me closer. Lord, I pray that every aspect of my life may ultimately become consumed with a longing to serve You and Your holy Will. Jesus, I trust in You. There is one thing, and one thing only, that has the power to free sinners from the fires of hell. That one thing is Mercy. God offers His Mercy freely and in abundance, but He has also chosen to offer His Mercy in response to our prayers when they are prayed with the utmost faith and childlike confidence. Jesus cannot refuse a heart that is pure and is filled with love for sinners. Your heart must become this way. You must strive to love sinners with such a burning love that the Lord is “obliged” to answer your request for Mercy. He obliges Himself out of love in response to the love you have in your heart (See Diary #873). Do you realize that you have a certain “power” over the Mercy of God? This is only so because the Lord wills it. He has willed to respond to the love you have in your own heart with an outpouring of His Mercy upon those whom you love. Your love, when pure and unwavering, becomes a door through which the Heart of Christ pours forth His grace. Reflect upon your love for sinners and place that love before the Lord as your powerful prayer. He will see your love and respond with abundant generosity. Lord, I love You and I love sinners. Help me to love all people more deeply and to offer that love to You as my pure prayer. May the love in my heart be the cause of Your own outpouring of grace and an instrument of Your Divine Mercy. Jesus, I trust in You. Meeting someone of great power can be cause for excitement. For example, meeting with the president of a company you wish to work at, or meeting someone famous for the first time, or meeting with the bishop or the Holy Father may all cause a certain excitement. But it could also cause a certain fear and anxiety. Of course the most important and “influential” person you will ever meet is your God. God is Omnipotent and Omniscient, that is, All-Powerful and All-Knowing. He is also All-Loving and, in that perfect love, descends from His throne of grace and majesty to converse with you, to care for you, and to fulfill every need that you have. He comes to fill you with the abundance of joy. Each “meeting” with our Lord must be one of great excitement in that it must be taken seriously, with attention and love being offered back to this most important Person you will ever come to know (See Diary #885). What is your interior experience when you go to Him in prayer? Is it an encounter in which you are overly casual and unprepared? Is it an encounter that gives you fear and anxiety, looking for ways to avoid Him? Or do you allow yourself to be comforted and consoled by the fact that the God of the Universe cares for you enough to step down from His throne of grace and converse with you in your weakness and sin? The Lord’s perfect humility should delight and amaze you and give you courage to turn to Him with your whole heart. Lord, I am amazed at Your love for me. You who are the God of the Universe come to me in my weakness and sin. You are attentive to me and offer the perfect care of a loving Father. Help me to always be in awe of the humility You manifest as You descend from Your throne of grace and enter my soul. Jesus, I trust in You. It’s easy to love God when we feel like it and when life is going well and is quite easy. But when life is challenging, we are immediately tempted to turn in on ourselves and, in so doing, turn from our love for God. But a true sign of holiness is that we love God no matter what we feel or experience throughout our day. Come rain or shine we must not waver in our love for our God and others (See Diary #893). Do you allow your emotions to dictate your faith? Do you allow the difficult circumstances of life to take you away from your absolute fidelity to your God? This is a real temptation and one that many fall into. Reflect, today, upon how you deal with difficult days and difficult moments. Seek to renew your faithfulness and love in the most challenging moments and you will discover that this act transforms you in ways that “easy living” never will. Lord, I give You this day and I give You my whole heart this day. No matter what I feel or experience today or tomorrow I commit to You to remain faithful in all things. I promise not to allow daily hardships or burdens to weigh me down and damage my faith. My Jesus, I love You and choose to remain faithful to You always. Jesus, I trust in You. Are you patient? Both patience and impatience are born from a struggle within your will. There are many times in life when your will is drawn by something other than God, wanting something that God is not leading you to. Patience is a virtue that enables you to step back, take a deep breath and redirect your will to that which God alone has chosen for you. Patience is the gift of strength within you to deny your own immediate tendencies in deference to that which the Lord gently speaks to your heart. When you have patience, you are not controlled by the confusion caused through your disordered emotions or untamed feelings and desires. Patience brings order, focus and purpose. And the gift of patience, when it enables you to submit your will to the Divine Will, gives God immeasurable glory (See Diary #904). How patient of a person are you? What controls your actions and influences your decisions the most? Are you more controlled by your disordered desires, or by God? Reflect upon this question today and make an act of submission of your will to the Will of God. Making this choice will immediately strengthen you and bring forth the virtue of patience in your soul. Lord, I am so very impatient at times. I allow many feelings, emotions and passions to control me and to dictate my actions. I surrender my will to You this day. May Your Divine Will be done in all things rather than my own. Jesus, I trust in You. When we desire to accomplish the Will of God in this world and do wonderful things for Him, we can sometimes seek to do things our way according to our timing. But to truly accomplish the Will of God you must pray hard, surrender yourself to His holy Will, and then even surrender the fulfillment of His Will. It’s not a matter of just doing what you think best, when you think best; rather, it’s a matter of accomplishing His holy Will as He directs it, when He directs it. Nothing more and nothing less. This is an act of trust and it will be rewarded with God accomplishing great things in accord with the perfect plan He has set forth, in accord with His timing (See Diary #916). Do you want to do great things for God? If so, tell Him so and make an act of total surrender to His Will. And then wait, and wait and wait. Keep trusting and keep surrendering and trust that He will inspire you to action when the time is right. Reflect upon your patience with the Will of God today. God will always wait for the perfect moment to inspire you to act. If you can patiently wait on Him, you will see an abundance of Mercy flow from Heaven. Lord, in surrendering myself to You and entrusting myself to You as an instrument for Your glory, I pray that I may act only when and how You direct me to act. Help me to always know that You are perfect in Your wisdom and orchestrate all things in a harmoniously beautiful way. I trust in Your Will and choose it over my own will, today and always. Jesus, I trust in you. How nice it is when you have a friend that you trust with every detail of your life. We long to know others and we long to be known by others. When you find someone in whom you can confide even the smallest struggle or express the smallest joy, you have found a true friend. The Lord desires to be your closest friend. You must work to foster a “detailed” relationship with Him. He knows all things and knows you better than you know yourself. But this should not prevent you from pouring your heart out to Him. You must express to Him even the slightest concerns you carry and rejoice with Him over the smallest of joys. Speaking to God about the details of life brings joy to His Heart (See Diary #921). When you speak to God, are you honest? Do you trust Him? Do you open every part of your life and face it in His presence? The Lord knows all but He wants to hear it from you in prayer. Speak to Him today. Reflect upon how often you go to Him with the smallest concern or the slightest joy. Give joy to Him today as you speak to Him as your closest friend and confidant in life. Lord, You know all things and You know me through and through. As I recognize this fact, help me to always be fully honest with You. Help my prayer to always reflect the truth of my heart. And as I speak to You about the details of my life, I allow You to enter in, to help, to heal and to rejoice in all that You reveal. Jesus, I trust in You. When God looks at the world, what does He see? Most certainly He sees the beauty of His creation, the perfect order of His design and the presence of His sons and daughters. But He also sees the horror of the multitude of sins. Even the slightest sin or imperfection cannot escape His sight. Imagine trying to take in the sins of the world with one glance. But in His perfect Mercy He allows Himself to be consoled by those humble and holy souls who are specially chosen by Him. Yes, all people are chosen, but certain souls respond to the heights of holiness more than others, and in so doing, combat the evils of our world in a powerful way. This is one of the unique callings of those living in the cloistered religious life, hidden from the world with a single focus on interior conversion. We may not see the benefit to such holy souls, but God does and His wrath is turned into Mercy, especially on account of these and all holy souls (See Diary #926). Reflect upon the fact that you are one of these chosen souls. You may not be called to the hidden life of a cloister, but you are called to achieve great sanctity. As God sees the holiness of your life, His justice is satisfied and His Mercy flows forth. Though the things you say, the thoughts you have and the prayers you pray may never be known by another, God who sees all things sees your heart and the holiness that you achieve in life. This holiness will do more than all the words and actions you could ever accomplish on your own. You are a chosen soul. Fulfill that mission and you will become a powerful instrument of the Mercy of God. Lord, I thank You for choosing me for holiness. I accept this calling and seek to serve You with my whole heart. My life is Yours, dear Lord, do with me what You Will. Jesus, I trust in You. Do you aspire to holiness of life? If so, you cannot do this on your own. You need the help of another, and even many others. The Lord has given us numerous ways to be directed by the loving hand of others. Some are blessed to have a spiritual director of many years who directs them in accord with the Mind and Heart of Christ. But most are called to rely upon the general direction offered by Christ through His Church. We do so when we find a confessor to whom we regularly confess our sins. We do so when we study the lives of the saints and learn from their wisdom. We do so when we listen attentively at Mass seeking to soak in the words our Lord wishes to speak. And we do so when we allow people of true holiness to come to know our souls so as to offer their humble counsel (See Diary #938). How do you allow the Lord to direct your soul? Do you listen to Him speak to you in Confession? Do you listen attentively at Mass, through the wisdom of the saints and through the teachings of the Church? Do you seek out those people whom God has placed in your life to help you on your way? Reflect, today, upon the ways that God wants to use others to help direct your life toward holiness and embrace this gift as His act of abundant Mercy. Lord, You and You alone are my Director and Guide. But You choose to guide me through the mediation of others. May I always be willing to humble myself so as to receive the many helps You offer me through this journey of life. I pray I will never turn away from these instruments of Your Mercy and grace. Jesus, I trust in You. “The Lord giveth and the Lord taketh away…” (Job 1:21). How true this is. There are times in life when we experience the abundant consolation of God. It may be at moments of great family joy, or when we experience the unconditional love of another. At times we sense the powerful presence of God in our life of prayer and are filled with joy. But there are many other moments in life when God seems distant and our souls feel desolate. Do not worry about this. If this is caused by sin, then face that sin, confess it and move on. But if it’s not a result of any sin, then know it’s an opportunity for you to deepen your faith and your love of God despite how you feel. This is a true grace and we should be grateful that God loves us enough to call us to faith even when we feel very little inside (See Diary #943). What do you experience in your soul right now? Do you sense the closeness of God and does that closeness give you great consolation? Or do you feel dry and desolate as if God is hidden from you? We must rejoice in each experience and know that God offers the grace we need for each moment. Renew your faith this day no matter how you feel. Do it especially in moments of much desolation. Your act of faith in those moments will open the gates of God’s Mercy to you and to the world more than you may realize. Lord, I love You now and always and renew my love for You no matter how I feel. In good times and in difficult ones I choose to love You, to have faith in You and to trust in You. You are the God of consolation and the God of desolation. I choose You no matter what. Jesus, I trust in You. Precious Lord, I thank You for Your suffering. For in this act You took human suffering into Your glorious soul and redeemed it. You endured the effects of my sin and said not a word. Lord, You paid the price for my sins and You did so with perfect love and resolve. Give me the grace, dear Lord, to embrace all that I suffer and to unite it to the redeeming power of Your holy Cross. In that unity, free me from my sins and pour forth Your abundance of Mercy. Jesus, I trust in You. Does it matter what the Will of God is for you? That may sound like a strange question at first. But think about it. Does it matter what God wills of you? What if He were to call you to constant work? Or what if He were to call you to a restful repose? Or what if He were to fill you with delight? Or remove all delight from your soul? Or call you to be extolled and honored in the sight of many? Or draw you into the desert of solitude and hiddenness? The truth is that it matters not what God’s call is in our lives, it only matters that He calls. We must strive for a holy indifference in our lives. A “holy” indifference is not indifference to God and His Will; rather, a holyindifference is a detachment to all preferences regarding what the Lord asks of us. We must be ready for all but we must be willing to receive nothing. The goal is to be ready for God and His Will, whatever it may be (See Diary #952). Reflect upon whether or not you are ready and willing to accept whatever God wills of you. What He wills is not as important as the fact that He wills. This may be a difficult subtlety to grasp at first. But it’s important to understand. The simple truth is that we should be ready for anything God asks of us without clinging to our personal preference. If you can achieve this level of detachment, the Mercy of God will begin to flow in abundance in your life, and through you into the lives of many others. Lord, I surrender to You all my selfish preferences in life. I give You complete freedom to do whatever You will in my life. No matter what You ask of me, I accept, and no matter what You take from me, I give to You. Give me, dear Lord, the grace of a holy indifference so that I may be free to love You and Your holy Will more than life itself. Jesus, I trust in You. Pride can consume us. When it does, all we think about is ourselves and our own pain. Perhaps you can relate to this. Maybe you’ve encountered a wound and you sit and sulk over that wound. It creates bitterness in your heart and you seek to heal that wound. But when this happens, it is often our pride that leads us to remedy hurt through a form of revenge, anger or self-pity. We can even fool ourselves into thinking that our desire to solve our problem and rid ourselves of the hurt is justified by God. But if you are willing to let the Lord penetrate the inner secret of your soul, you will see that your motivation in many things is your wounded pride. This is not the solution. What is needed is Mercy. Mercy solves every problem. First, you must seek Mercy from God, then you must offer it unconditionally to others. There is no other way to resolve the hurt and confusion present in your soul. This is a hard lesson to learn, but necessary (See Diary #958). What is it that motivates you? Perhaps you have some interior obsession that you can’t seem to shake. Perhaps it lingers in your mind day and night. Be attentive to this and identify it as your own sin. Do not hesitate to humble yourself to the fullest extent and do not be afraid to take ownership of the pain you feel. Pointing the finger at another does not heal and does not remedy anything. We are solely responsible as a result of our pride. Seeing this is a grace of the Lord’s mysterious and unfathomable Mercy. Lord, I cannot shake the anger, the hurt and the pain I feel at times. It is overwhelming and all-consuming, subtle and deceptive. But it is my sin, lurking within me drawing me from You, keeping me from true repentance. Lord, I do repent and I beg You to humble me so that I may love You with my whole being. Jesus, I trust in You. When we suffer, we look for a way out. We seek relief. But from Heaven, we will be able to look back and see the immense power of freely chosen and embraced suffering. It’s not that suffering is good in and of itself; rather, it’s that suffering has been redeemed and endowed with a spiritual power by God as a result of the sufferings of Christ. Therefore, if you trust in the Lord, let Him reveal to you, here and now, the great value of your suffering freely embraced. By embracing every hardship that comes your way, you will be making an offering to God that can only be understood by grace. This will not make sense to the world, but it will become a powerful weapon of Mercy through which the Lord will do great things to you and through you, He will flood the world with His grace. Do not wait until Heaven to become aware of this sacred gift of the redemption of your inner suffering offered in confident prayer to God (See Diary #963). Are you aware of the power of your suffering when you freely unite it to the sufferings of Christ? Does this make sense to you? This realization is only possible by grace and is only embraced by that same grace. Reflect, today, upon what you do suffer interiorly and do not shy away from it. Face it, embrace it and love it. For in that holy embrace, God will work wondrously in and through your life. Lord, make me attentive to the value of all I suffer in my soul. Help me to see this as a gift of Your Divine Mercy. I recognize the fact that I do not recognize the power in this holy gift. Give me Your eyes to see my suffering as You see it, and Your Will to embrace it with a holy embrace. I make this offering to You, this day, dear Lord. Jesus, I trust in You. No, priests are not perfect. They sin day in and day out. They are in constant need of repentance and conversion in their daily lives just like all the rest of humanity. But they are priests. And because of their sacred ordination, the Lord speaks through them in a clear yet mysterious way. Some speak with the authority of Christ only when speaking the words of Consecration at Mass or the words of Absolution in the Sacrament of Reconciliation. Others embrace the charism of their ordination and are used by God in a multitude of other ways, through their preaching, their holy living, and their words of counsel offered to their flock. Seek out these holy priests. Listen to them and allow the Lord to guide you through them. For in listening to the voice of God, spoken through them, you will be blessed with an abundance of Mercy (See Diary #968). Ponder today, with all charity, the priests that God has placed in your life. It may be your own parish priest, or a priest speaking through the written word, or a priest speaking through some other form of modern communication. God will point you to His holy priests and will speak to you directly through them. Listen to them, for in hearing their words you will be hearing the words of the Mercy of God. Lord, I thank You for establishing the sacred priesthood as a sign of Your continued sacramental presence in the world. I pray for all priests, especially those You have entrusted with my pastoral care. May I always be open to You, speaking through them, in their sacred ministry. And may I respond with abandon and generosity at the sound of Your voice spoken from their lips. Give me humility, dear Lord, that I may always hear Your voice spoken through priests. Jesus, I trust in You. If you were aware of great famine in a far away land, and were also blessed with unlimited resources to address that famine, why would you withhold this gift from those in need? Hopefully you wouldn’t. Hopefully you would see your responsibility and do what was necessary to satiate the thirst and satisfy the hunger of those in dire need. But there is a great famine, and you are blessed with an unlimited resource to address this famine. The famine is the hunger and thirst for the Mercy of God. Yet most people who are starving for this Mercy are unaware that this is what they seek. The unlimited resource you have been given is the Mercy of God. He has entrusted you with the task of dispensing His Mercy and withholds nothing from you. Do you see the importance of your cooperation with this grace? Do not shy away from God’s call to bring His limitless Mercy to others (See Diary #975). In what way is God calling you to distribute His wealth. No one is deserving of the Mercy of God, that’s why it’s Mercy. But everyone is invited to feast on this grace. The Lord wants to use you as a dispenser of His Divine Mercy. All you need to do is to be ready and willing to allow Him to use You as He wills. You will not be acting on your own; rather, God will act through you. But He is only able to act if you let Him. Lord, I thank You for the limitless gift of Your Divine Mercy. And I thank You that I am called to become a dispenser of this grace. Help me to say “Yes” to You in all things and to embrace the responsibility that You have given to me. Use me, dear Lord, however You will, and give me the wisdom and courage I need to be a generous dispenser of Your Divine Mercy to a world in dire need. Jesus, I trust in You. Has your soul been “transpierced” by God? Does He “pervade” you? Do you allow yourself to “dissolve” into His divinity and become “enveloped” by His Mercy? There are so many words we can use to describe our relationship with God. Though they all add to an articulation of who God is and what sort of relationship we should have with Him, none of them will ever fully be able to present the mystery of our union with Him. We are called to “oneness,” to “transformative union.” And this union is like a drop of water being placed into the mighty ocean. Slowly and surely, that drop of water is lost in the vastness of the ocean depths. So it is with God. We are called to a unity so deep and so profound that words will never suffice to speak what the soul is called to experience (See Diary #983-984). What is your relationship with God like? Are the words above even a faint description of your life of prayer and communion with Him? Do you see and experience Him interiorly, calling you to His unfathomable depths of Mercy? Or is He distant to you, seen by you as someone you talk about and are aware of, but not living a “holy fusion” with? The words we use matter because they point to the deeper reality. Reflect upon how you would describe your relationship with God. And when you find that no words suffice, you are on the right track. Most Holy Trinity, may my whole being become consumed by the brightness of Your radiance. May I become possessed by You in every way so that it will no longer be my life that is lived, but is Yours living within me, consuming me and transforming me. May I be like that one small drop of water, entering into the mighty Ocean of Mercy. Jesus, I trust in You.